Teeth are strong and durable, intended by nature to last your lifetime. Yet even a healthy lifestyle, terrific oral hygiene, and professional dentistry cannot guarantee a problem-free mouth. Fortunately, Dr. Olivia Hart in Richmond, VA provides a variety of restorative services to keep your smile looking great and functioning properly. Tooth-colored fillings – BPA-free composite resin is a versatile choice for tooth decay, chips, cracks, and other minor repairs or modifications. These restorations blend unnoticeably with teeth. Dental veneers – While veneers are often considered for aesthetic enhancement, they are also restorative in nature. Veneers are layers of hard porcelain, cemented to the front surfaces of teeth to disguise flaws or improve the appearance of shape, size, alignment, or color. Veneers strengthen teeth with soft enamel, chips, or cracks. Dental caps – A dental crown fits over a prepared tooth which was compromised by trauma or decay, restoring natural shape, appearance, and function. A lustrous porcelain crown may also be used with a dental implant to replace a missing tooth. Dental bridge – A bridge unit is comprised of a crown at either end, with an artificial tooth (or several) between. In some cases, implants can serve as an anchor for a bridge, avoiding impact to healthy adjacent teeth. Dr. Hart offers all-ceramic dental bridges for a natural appearance and a metal-free restoration. Why have your teeth restored? You have 32 teeth, so why be concerned if one fractures, breaks, or gets a bit of decay? 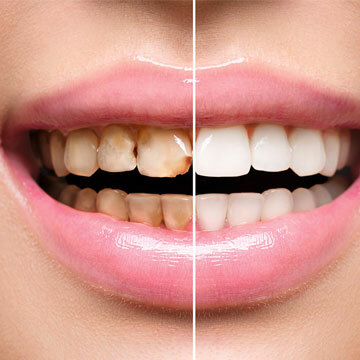 Dental problems do not resolve on their own – without treatment, they get worse. A little cavity eventually becomes a big hole that reaches the nerve center of the tooth. It could develop into an abscess accompanied by acute pain, and it may require extraction. A small chip or crack could trigger intermittent toothaches and temperature sensitivity. It also becomes a weak point in the tooth, leading to more destruction. Contact Dr. Olivia Hart of Richmond Family Dentistry to restore your smile with one of our exceptional dental restorations. Click here to make an appointment now or call (804) 381-6238 to learn more.